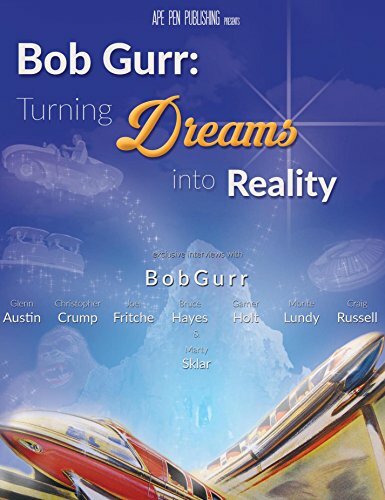 Bob Gurr: Turning Dreams into Reality The documentary, Bob Gurr: Turning Dreams into Reality, tells the story of one of Walt Disney's earliest 1954 Imagineering Legends, Bob Gurr. His career spanning 45 years creating 250 projects with Disney and beyond will be explored. From Disneyland to Las Vegas, Olympic spectaculars to rock star shows, Bob's creations included Monorails, Abraham Lincoln mechanical animation, Pirate Battle Shows, even massive animated figures of King Kong and Godzilla. Viewers will learn much about how these attractions were created from those who were there sharing these creations. Eight theme park creators who worked with Bob over these years will describe the unique ways in which he created a vast variety of attractions. The cast includes Disney Ambassador to the World Marty Sklar, Imagineering VP Craig Russell, Imagineer Chris Crump, and many others. Bob Gurr: Turning Dreams into Reality is directed and produced by Carlene Thie, President of Ape Pen Publishing. The documentary stars: Glenn Austin, Christopher Crump, Joel Friche, Bob Gurr, Bruce Hayes, Garner Holt, Monty Lundy, & Marty Sklar. Run time: 52 minutes. The Making of Turning Dreams into Reality Eight "witness's" promptly assembled over a weekend in the summer of 2014 where a team of camera and audio technicians led by a director captured many hours of "testimony" as to what makes Bob "tick". At last she had enough evidence to commence a story to answer all the how questions. Glenn Austin, Christopher Crump, Joel Friche, Bob Gurr, Bruce Hayes, Garner Holt, Monty Lundy, & Marty Sklar all got in their thoughts, and a few digs too. luckily, Carlene and Bob had a lot of suitable photographs that could be used in the documentary. Walt Disney Imagineering also furnished a number of specially licensed company owned photographs.